WHERE CAN I FIND YOUR AMMO IN STOCK? AMMO CHOICES FOR "DEER and HOGS"
WHY ARE YOUR SHIPPING CHARGES SO HIGH? "CRIMP JUMP" or "BULLET CREEP"
HOW WILL THIS (name any) AMMO FEED AND FUNCTION IN MY “GUN”? 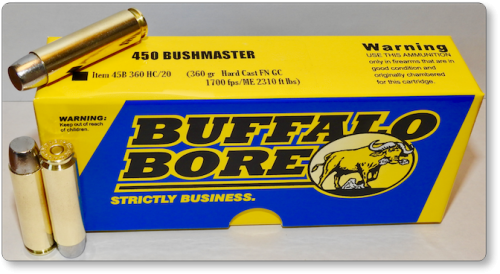 As of this writing (03-2018) we’ve been getting requests to make some heavy duty 450 Bushmaster loads since the cartridge was introduced around 10 years ago. 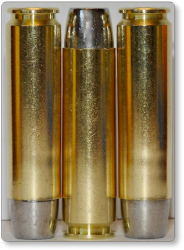 This is a cartridge that will hammer North American big game species, mostly because of its caliber. We are making four loads (which are all-purpose designed) to cover your hunting needs from smallish whitetails to bull elk, grizzly, and moose. If you know your range and understand your bullet drop, there is no reason not to use this cartridge out to 250+ yards. These are our four current (we may add more at some time) 45 Bush loads and their projected velocities. We will post real world velocities obtained from our test guns with each load. As each new load becomes available, we will write a short tech article about its intended uses and limitations. With regards to item 45B 360 HC This load is utilizing a very hard (22 BHN) flat nosed hard cast bullet, designed not to expand on typical mammals and what this means is that you should get several feet (over four feet, depending on which bones are struck) of straight-line penetration. The flat nose does incredible terminal damage compared to a round-nose non-expanding bullet. This is the load to use on dangerous game such as 1,000 lb.+ bears or Bison, but that does not mean you cannot hunt elk or an even smaller big game like deer with it, just remember it will penetrate deeply enough to kill four deer with one shot if you line them up correctly. This load was very accurate from both test rifles. You can see my posted velocities below in real world, over-the-counter firearms, for item # 45B 360 HC. Field Proven rifle and gun ammo. Maximum firepower ammo. Best ammunition for rifles and guns for sale. Buffalo Bore. Strictly big bore. Strictly Business. You must be 18 or older to order ammunition. Ammunition must ship UPS ground. Due to Department of Transportation regulations, we cannot accept returns on Ammunition. Make sure to use the correct ammunition in your gun. Check local laws before ordering.